Thought I’d come right out in the title and say there are spoilers herein, but I won’t start them until I warn you specifically. The root cause of this post is that I want you to either listen to or read No Ordinary Time by Doris Kearns Goodwin and Your Fathers, Where Are They? And the Prophets, Do They Live Forever? by Dave Eggers. Go get them both from your library or independent local bookseller. One’s a history, one’s a novel. They’re both remarkable and I must get you to read them. Or, really, listen to them. They both make ideal audiobooks. Back to the promise of my title…I despise spoilers. I absolutely won’t read the back cover of books or the reviews because there are so darned many clues to the book that I want to discover, not be handed. I don’t want to know before I read a text where the basic story is going. I don’t want to know how many years Mitchell’s new book spans (thanks for nothing, NPR) because even that bit of information sets up an expectation and the beginning of my calculations. So in this post, I will warn you of minor spoilers (the type most readers don’t mind), and what I call SPOILERS, which are genuinely much less informative or revealing than any major book review is. So I’m overly careful with what I warn you about. Because I try to preserve your unsullied reading experience as much as I can. I prefer to read completely uninformed, and I assume out of kindness that you do, as well. 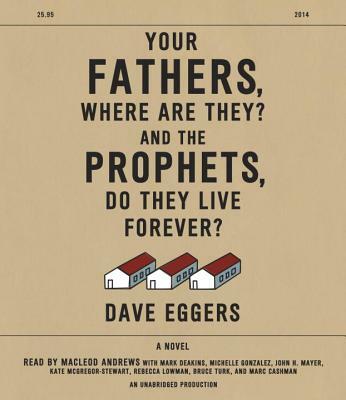 Completely unwitting is how I began listening to Dave Eggers’s Your Fathers, Where Are They? And The Prophets, Do They Live Forever?. I knew absolutely nothing about the novel when I downloaded. And after approximately 4 lines, I was completely hooked. I’m not sure I will listen to many novels on audiobook, because I prefer to read fiction so I can pause, reread, and stop on the visual placeholder of a word rather than hinging on voices. But [minor spoiler alert] Eggers’s book is entirely dialogue. This theatrical set up is very kind to the audiobook format. When I heard the title page and the list of voice actors, I was confused. It’s very rare to have an audiobook have more than one narrator. (Another minor spoiler alert: Gone Girl had two, because the novel has two narrators.) But each character needed a voice for YFWATATPDTLF to function as an aural text. Holy gobsmacking guacamole salad, y’all. You have to hear this book. I don’t know if you have to read it. I haven’t read it. I’ve only listening to it read by highly skilled voiceover actors. The New York Times Sunday Book Review was not kind to the novel, in part because the reviewer missed several nuanced points about the characters and dialogue. And I believe the audiobook and the actors cast in the roles were the difference between my interpretation and Phil Klay’s. The reason Klay missed something rather important may have been that he read rather than heard the book, for he seemed to have not understood that many of the characters seek to fool the main character. They agree with or disagree with him at various times with the intent of beguiling. Klay seems very angry that some of the characters would agree with wildly inappropriate speeches by a character, but the way I heard the text, those agreeing were patronizing the speaker. Perhaps the acting choices of the audiobook performers made me more aware of this. Maybe giving Eggers the benefit of the doubt for having meticulously rendered several highly flawed characters allowed me to see the dialogue for what it was: not Franzian political diatribe but nuanced interpersonal psychological chess. I highly recommend listening to Eggers’s novel. As a character study of desperation and humanity, it’s compelling. As an audiobook, it’s ideal. 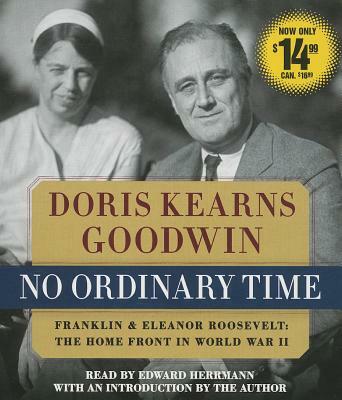 I also highly recommend listening to Goodwin’s No Ordinary Time. As a historical study in the way personality flaws form the shifting sands on which history explodes, it’s riveting. This entry was posted in Fiction and tagged books, reading. Bookmark the permalink. When do you listen to audiobooks? In the car? Commuting? Around the house? I feel like it would be an efficient way for me to actually tackle some new books but I’ve only ever listened to them on long road trips. Maybe I’ll try it while exercising. First I’ll have to start exercising. I only used to listen to them in the car on long trips, and then kids’ books. Now? Cooking, cleaning, driving, at the playground. Yes, seriously. I put it on speaker so the kids don’t think I’m ignoring them. And I listen while they play. There’s a 15 second rewind for when I have to navigate bickering. I’m genuinely finishing a book every two days just in commute, cook, clean, and playground time. Dude. Library books in your ears when you put away laundry? Shut the front door. Enough said. I think doing it while cooking would be very wise and therapeutic for me. I need a distraction from the pain. Start with Tina Fey or Amy Poehler or someone else you like reading a history without any numerical data. No statistics textbooks, mmmmkay? Audio is not a format ideal for numerical data. And check out that Eggers novel. Fer realz.